Digital Revolution, a new BBC TV programme, was launched last Friday. Due to be broadcast next year, the programme will be looking back over the first 20 years of the web and considering what the future might hold. The show will be considering how the web has changed society and the implications for things like security, privacy and the economy. 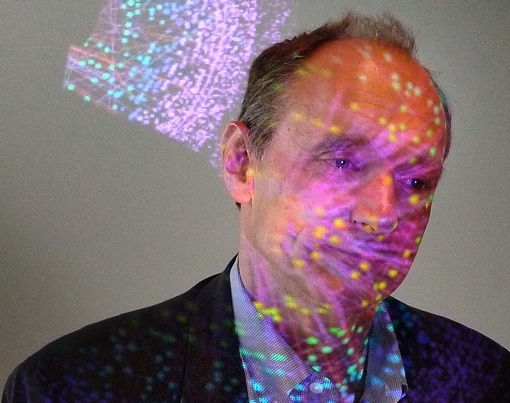 Tim Berners-Lee. Photograph by Documentally, some rights reserved. Unlike — well probably every other TV programme I’ve ever come across — each programme will be influenced and debated on the web during it’s production. Some of rushes and interviews will be made available on the web (under permissive terms) so that anyone can contribute to the debate, helping to shape the final programme. To kick all this off the BBC hosted a debate chaired by Aleks Krotoski with Tim Berners-Lee, Bill Thompson, Susan Greenfield and Chris Anderson. The audience was almost as impressive as the folks up on stage a great mix of geeks and journalists, and luckily I managed to wangle an invite (probably because I’ve had a tiny, tiny role on the project). Anyway… the presentations were very cool, and while I tweeted the best bits on the day I thought I would write up a short post summing it all up. You know, contributing to the debate and all that. The thing that struck me most were the discussions and points made around the way in which the web has provided a platform for creativity, and the risks to it’s future because of governments’ failure to understand it (OK, the failure to understand it is my interpretation, not the view expressed by the speakers). I’ve written previously about how the web’s generative nature has helped enable an eruption of creativity, spawning a new economy in it’s wake; and how governments have failed to grasp that it’s the people that use the medium that need policing not the medium itself. But as you might expect from such an illustrious bunch of people the panel managed to nail the point much better than I ever could. To misquote TimBL: The web should be like paper. Government should be able to prosecute if you misuse it, but they shouldn’t limit what you are able to do with it. When you buy paper you aren’t limited in what can be written or drawn on it, the and like paper the Internet shouldn’t be set up in such a way as to constrain it’s use. The reason this is important is because it helps to preserve the web’s generative nature. TimBL points out that people are creative, they simply need platform for that creativity, and if that platform is to be the Web then it needs to support everyone, anyone should be able to express that creativity and that means it needs to be open. As an aside there was a discussion as to whether or not access to the Internet is a ‘human right’ — I’m not sure whether it is or not, but it’s worth considering whether or not if everyone had access to the Web whether it could be used to solve problems in the developing world. For example, by allowing communities to share information on how to dig wells and maintain irrigation systems, information on health care and generally providing educational material. It is very easy, for us in the West to think of the Web as synonymous with the content and services currently provided on it and whether they would be useful in developing countries. But the point really should be if anyone, anywhere in the world where able to create and share information what would they do with it? My hope would be that the services offered would reflect local needs — whether that be social networking in US colleges or water purification in East Africa. Just because you can read everything out there doesn’t mean you should. If you found a piece of paper blowing in the wind you wouldn’t expect it to be edifying. But what does open mean? Personally I think that an open web is one that seeks to preserve it’s generative nature. But the discussion last Friday also focused on the implications for privacy and snooping. Governments the world over, including to our shame the current UK Government, are seeking to limit the openness of the web; that is rather than addressing the specific activities that happen on the web, they are seeking to limit the very platform itself. ISPs around the world, at the behest of governments, are being asked to track and record what you do on the web, everything you do on the web. Elsewhere, content is being filtered, traffic shaped and sites blocked. The sorts of information being collected can include your search terms (pinned to your IP address) and the sites you visit. Now for sure this might, sometime include a bunch of URIs that point to illegal and nefarious activity, but it might also include (indeed it’s more likely to include) URIs relating to a medical condition or legal advice or a hundred and one other, perfectly legal but equally personal bits of information. Should a government, its agencies or an ISP be able to capture, store and analyses this data? Personally I think not. And should you think that I’m just being a scaremonger have a read of Bill’s post “The digital age of rights” about the French government’s HADOPI legislation. I hoped that the web would help us know our neighbours better, so that we didn’t go and kill them. That hasn’t happened but it does now mean it’s much harder to get away with it – the world will now know if you do kill them. Governments know this, which is why some now try to lock down access to the Internet when there is civil unrest in their country. And it is also why the rest of the web tries to help them break though. Few Western governments, would condone the activities of such Totalitarian states. But it is interesting to consider whether Western governments would support North Korea or Iran setting up the kinds of databases currently being debated in Europe and the States. Now they might point out that the comparison isn’t a fair one since they are nice, democratic governments not nasty oppressive ones. But isn’t that painfully myopic? How do they know who will be in power in the future? How do they know how future governments might seek to use the information they are gathering now? Seeking to prevent snooping on the Internet aside there is another reason why the web should remain open, and it is the reason why it’s important to fight for One Web. Susan Greenfield quite rightly pointed out that ‘Knowledge is to be found by creating context, links between facts; it’s the context that counts’. Although she was making the point in an attempt to take a swipe at the Web, trying to suggest that the web is no more than a collection of facts devoid of context, it seems to me that in fact the web is the ultimate context machine. (One sometimes wonders whether she has ever actually used any of the services she complains about, indeed I wonder if she uses the web at all). The web is, as the name suggest, a set of interconnected links. Those URIs and the links between, as TimBL reminded us, are made by people, they are followed by people and as such you can legitimately think of the Web as humanity connected. URIs are incredibly powerful, particularly when they are used to identify things in addition to documents. When they are used to identify things (dereferencing to the appropriate data or document format) they can lead to entirely new ways to access information. An example highlighted by TimBL is the impact they might have on TV channels and schedules. He suggested that the concept of a TV channel was limited and that it would be replaced with complete random access. When anyone, anywhere in the world, can follow a URI to a persistent resource (note he didn’t say click on a link) then the TV channel as a means of discovery and recommendation will be replaced with a trust network. “My friends have watched this, most of them like it…” sort of thing. Of course to get there we need to change the way we think about the web and the way in which we publish things. And here TimBL pointed to the history of the web, suggesting that the next digital revolution will operate in a similar fashion. The web originally happened not because senior management thought it was a good idea – it happened because people who ‘got it’ thought it was cool, that it was the right thing and that they were lucky enough to have managers that didn’t get in the way. Indeed this is exactly what happened when TimBL wrote the first web server and client and then when the early web pioneers started publishing web pages. They didn’t do it because they were told to, they didn’t do it because there was any immediate benefit. They did it because they thought that by doing it it would enable cool things to happen. The last couple of years suggests that we are on the cusp of a similar revolution as people start to publish linked data which will in turn result in a new digital revolution. It’s starting to feel like the world has suddenly woken up to the whole Linked Data thing — and that’s clearly a very, very good thing. Not only are Google (and Yahoo!) now using RDFa but a whole bunch of other things are going on, all rather exciting, below is a round up of some of the best. But if you don’t know what I’m talking about you might like to start off with TimBL’s talk at TED. "Semantic Web Rubik's Cube" by dullhunk. Some rights reserved. overseeing the creation of a single online point of access and work with departments to make this part of their routine operations. driving the use of the internet to improve consultation processes. The Guardian has an article on the appointment. Our paper at this years European Semantic Web Conference (ESWC2009) looking at how the BBC has adopted semantic web technologies, including DBpedia, to help provide a better, more coherent user experience. For which we won best paper of the in-use track – congratulations to Silver and Georgie. Both platforms allow you to search and query the BBC data in a number of different ways, including SPARQL — the standard query language for semantic web data. If you’re not familiar with SPARQL, the Talis folk have published a tutorial that uses some NASA data. Nice presentation from Simon and Ben on how social discovery of content could work… “show me the radio programmes my friends have listen to, show me the stuff my friends like that I’ve not seen” all built on people’s existing social graph. People meet content via activity. Including an interview with me! It helps you to find co-references between different data sets. Interestingly it’s also licenced under CC0 which means all copyright and related or neighboring rights are waived. Following my invitation to speak at the WWW@20 celebrations [my bit starts about 133 minutes into the video] – this is my attempt to squash the most interesting bits into a somewhat coherent 15 minute presentation. 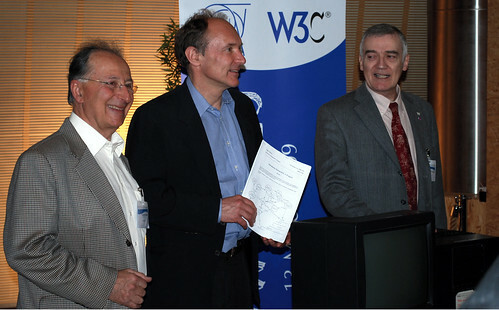 20 years ago Tim Berners-Lee was working, as a computer scientist, at CERN. What he noticed was that, much like the rest of the world, sharing information between research groups was incredibly difficult. Everyone had their own document management solution, running on their own flavour of hardware over different protocols. His solution to the problem was a lightweight method of linking up existing (and new) stuff over IP – a hypertext solution – which he dubbed the World Wide Web – and documented in a memo “Information Management: A Proposal“. Then for a year or so nothing happened. Nothing happened for a number of reasons, including the fact that IP, and the ARPANET before that, was popular in America but less so in Europe. Indeed senior managers at CERN had recently sent out a memo to all department heads reminding them that IP wasn’t a supported protocol – people were being told not to use it! Also because CERN was full of engineers everyone thought they could build their own solution, do better than what was already there – no one wanted to play together. And of course because CERN was there to do particle physics not information management. Then TimBL got his hands on a NeXT Cube – officially he was evaluating the machine not building a web server – but, with the support of his manager, that’s what he did — build the first web server and client. There then ensued a period of negotiation to get the idea out freely, for everyone to use, which happened in 1993. This coincided, more or less, with the University of Minnesota’s decision to charge a license fee for Gopher. Then the web took off especially in the US where IP was already popular. The beauty of TimBL’s proposal was it’s simplicity – it was designed to work on any platform and importantly with the existing technology. The team knew that to make it work it had to be as easy as possible. He only wanted people to do one thing, that one thing was to give their resources identifiers – links – URIs; so information could be linked and discovered. This is then is the key invention – the URL. To make this work URLs were designed to work with existing protocols, in particular it needed to work with FTP and Gopher. That’s why there’s a colon in the URL — so that URLs can be given for stuff that’s already available via other protocols. As an aside, TimBL’s said his biggest mistake was the inclusion of // in the URL — the idea was that one slash meant the resource is on the local machine and two somewhere else on the web, but because everyone used http://foo.bar it means the second / is redundant. I love that this is TimBL’s biggest mistake. He also implemented a quick tactical solution to get things up and running and demonstrate what he was talking about — HTML. HTML was originally just one of a number of supported doctypes – it wasn’t intended to be the doctype but HTML took off because it was easy. Apparently the plan was to implement a mark-up language that worked a bit like the NeXT application builder. But they didn’t get round to it before Mosaic came along with the first browser (TimBL’s first client was a browser-editor) and then it was all too late. And we’ve been left with something so ugly I doubt even it’s parents love it. The curious thing, however, is that if you read the original memo — despite its simplicity — it’s clear that we’re still implementing it, we’re still working on the the original spec. Its just that we’ve tended to forget what it said or decided to get sidetracked for a while with some other stuff. So forget about Web 2.0. For example, the original Web was read-write. Not only that but it used style sheets and a WYSIWYG editing interface — no tags, no mark-up. They didn’t think anyone would want to edit the raw mark-up. You can also see that the URL’s hidden, you get to it via a property dialog. This is because the whole point of the web is that it provides a level of abstraction, allowing you to forget about the infrastructure, the servers and the routing. You only needed to worry about the document. For those who remember the film War Games — you will remember that they had to ‘phone up individual computers — they needed this networking information to access the computer, they needed to know its location before they could use it. The beauty of the Web and the URL is that the location shouldn’t matter to the end user. URIs are there to provide persistent identifiers across the web — they’re not a function of ownership, branding, look and feel, platform or anything else for that matter. The original team described CERN’s IT ecosystem as a zoo because there were so many different flavours of hardware, different operating systems and protocols in use. The purpose of the web was to be ubiquitous, to work on any machine, open to everyone. It was designed to work no matter what machine or operating system you’re running. This is, of course, achieved by having one identifier, one HTTP URI and defererence that to the appropriate document based on the capacities of that machine. We should be adopting the same approach today when it comes to delivery to mobile, IPTV, connected devices etc. — we should have one URI for a resource and allow the client to request the document it needs. As Tim intended. The technology is there to do this — we just don’t using it very often. The original memo also talked about linking people, documents, things and concepts, and data. But we are only now getting around to building it. Through technologies such as OpenID and FOAF we can give people identifiers on the web and describe their social graph, the relationships between those people. And through RDF we can publish information so that machines can process it, describing the nature of and the relationship between the different nodes of data. The original memo described, and the original server supported, link typing so that you could describe not only real word things but also the nature of the relationship between those things. Like RDF and HTML 5 now does, 20 years later. This focus on data is all a good idea because it lets you treat the web like a giant database. Making computers human literate by linking up bits of data so that the tools, devices and apps connected to the web can do more of the work for you, making it easier to find the things that interest you. The semantic web project – and TimBL’s original memo – is all about helping people access data in a standard fashion so that we can add another level of abstraction – letting people focus on the things that matter to them. This is what, I believe, we should be striving for for the web’s future because I agree with Dan Brickley, to understand the future of the web you first need to understand it’s origins. Don’t think about HTML documents – think about the things and concepts that matter to people and give each it’s own identifier, it’s own URI and then put in place the technology to dereference that URI to the document appropriate to the device. Whether that be a desktop PC, a mobile device, an IPTV or third party app.